Chapter Five is coming soon, but will take a little longer than Four! 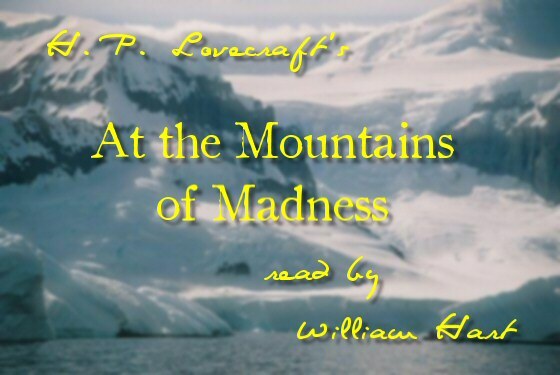 This entry was posted in 1920's, 1930's, 3D, At the Mountains of Madness, Audio, Audio Book, Audiobook, Book, Books, Elder Ones, Fiction, Free, Guillermo del Toro, H. P. Lovecraft, James Cameron, MP3 Files, Readings, Universal Studios, William (Will) Hart and tagged 1920's, 1930's, 3D, At The Mountains of Madness, Audio Book, Audiobook, Book, Books, Cameron, del Toro, Fiction, Free, Guillermo, Guillermo del Toro, H. P. Lovecraft, James Cameron, Lovecraft, MP3, Readings, Universal. Bookmark the permalink. Have just finished listening to part 3 and begun part 4 and continue to enjoy your project immensely. I think that Lovecraft comes across as I had forgotten about that great scene where the “curious regularities of the higher mountain skyline” are described. I am greatly looking forward to the movie adaptation, but it will not be possible for the army of artists and technicians at the studio’s disposal to create an impression as powerful as that which Lovecraft achieves through his written words. I’ve read a Lovecraft quote that suggested he did not care much for moves in general, and no doubt he would suspect any effort by cinematographers to render stories of cosmic horror. Do you know if he enjoyed story-telling on the radio and had any hopes for his work being rendered in that medium? Lovecraft actually seemed to enjoy going to the movies, when someone else had the money for the admission price! H. P. Lovecraft couldn’t really afford to be spending his money on the flickers; but is someone would take him as a guest, as would happen when he was in New York, he would jokingly say he was, “forced” into going; but enjoyed it anyway. As to his work being adapted for films or radio, I believe a couple of quotes from page 177 of Donald R. Burleson’s excellent, “H. P. Lovecraft: A Critical Study” should give you strong clue as to Lovecraft’s feelings about radio and film adaptations of his stories. Get the picture; or should I say, broadcast?